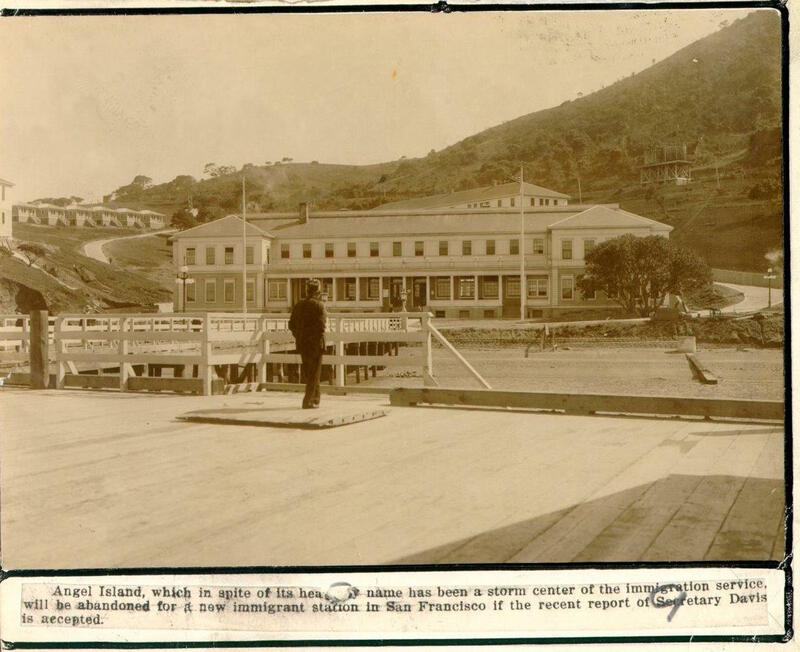 The caption on this photograph reads: “Angel Island, which in spite of its heavenly name has been a storm center of the Immigration service, will be abandoned now for an immigrant station in San Francisco if the recent report of Secretary Davis is accepted.” The caption suggests that Angel Island Immigration Station would soon close, and immigrants would be processed in San Francisco instead. As with the location on the San Francisco wharf used before 1910, the Chinese community in San Francisco argued that conditions were not safe at the immigration station. In November 1940, the immigration station relocated to San Francisco. “Angel Island immigration station,” Digital Public Library of America, https://dp.la/item/c5ce35aed466b60512fb42d1c6a36935.